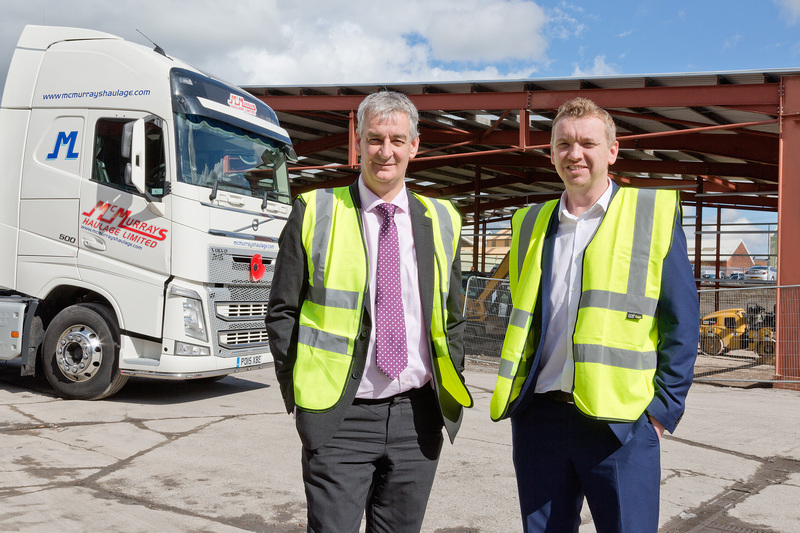 Haulage and warehousing boss David McMurray has been praised by MP Graham Jones after driving his business to an all-time high. The Hyndburn MP spoke out during the unveiling of £750,000 expansion project which sees family firm McMurrays building a 16,000 sq. ft. warehouse and transit shed on its 5.2-acre site. David, whose family established the business in 1971, has steadily grown the firm which now employs 70 people from the Hyndburn area. Member of Parliament Mr Jones says: “It is encouraging to see any local company doing well - and particularly impressive to see how David’s £10million a year operation is expanding. The new unit will provide a storage and shipment area for McMurray’ fleet of 50 modern trucks. The company provides a wide range of transportation services to customers in the UK, Ireland and Europe – always going the extra mile to provide its customers with a reliable service in modern vehicles, aided by logistics technology that allows their customers to track deliveries online. More information about McMurrays Haulage, including the McMurray family members involved in the business, is online at.